Phenomenal for those that like hotter coils in mech mods and/or users that prefer insanely-low resistance setups at higher wattage capabilities. Hohm Work can be used in both regulated and non-regulated devices. These are rated by Indonesia Chemistry at 2531mAh capacity, with a CDR of 21.5A and a pulse/peak rating of 40.6A. All ratings are subject to meet and/or exceed strict limitation policies set forth for DLr1, TID2, PVDL3, CLR4 mΩR5, and Temperature (°C). 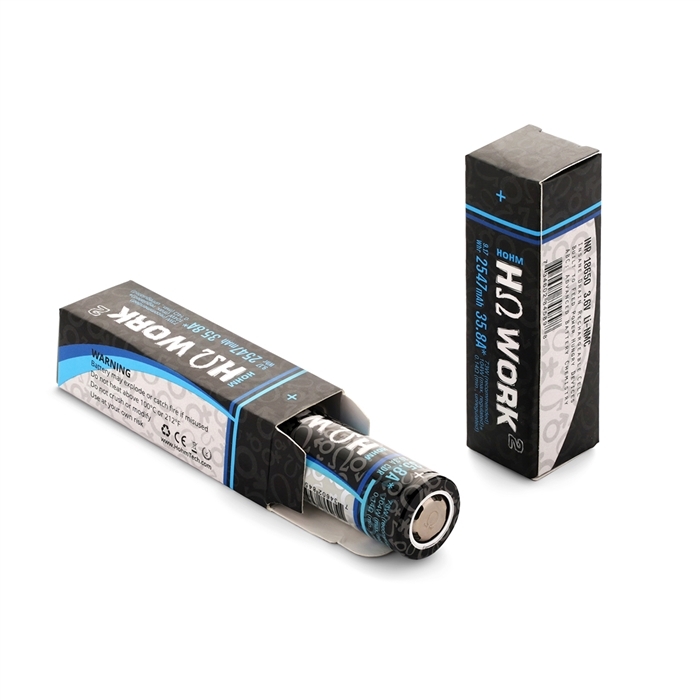 Hohm Work is based off the LG HE2 chemistry foundation, with manganese inert compound replaced with additional proprietary levels of cobalt & nickel to achieve unprecedented capabilities. HE2 chemistry consists of NMC already, but adjusting the NMC rations was key to achieving recorded levels. The user must have an appropriate understanding of the potential dangers of lithium ion batteries before purchase. Use caution when working with and using lithium ion batteries as they are very sensitive and may explode, burn, or cause a fire if misused or mishandled. Always charge in or on a fire-proof surface. Never leave batteries charging unattended. We are not responsible for any damage or injury caused by misusing or mishandling lithium ion batteries and chargers. No express or implied guarantee of compatibility with any device can be made. Charge only with a smart charger designed for this specific type of lithium ion battery. Do not mix and match old and new, used and unused batteries. Local regulations and laws pertaining to the recycling and disposal of lithium ion batteries vary so please consult your local jurisdiction regarding appropriate disposal. • Make sure that any battery wrap is in good condition. If that plastic sheath has holes or other damage, then replace it. • Always verify that you are inserting batteries properly. Check out the correct specs for any mod and follow those guidelines. • Replace batteries at the same time. If you have a mod powered by two batteries, always charge or replace those batteries in pairs. • Clean your mods on a regular basis. When your threads become dirty, your mod circuits can be disrupted and buttons can get stuck in place. Use a cotton swab or wipe to clean the unit with alcohol. • Watch your coil resistance limits. This is especially true for vaping aficionados who build their own coil setups. Remember, most experts recommend that you never go below .2 ohms, since anything below that level can increase the risk of accidents or other mishaps. • Store your batteries properly, to avoid shorting them out. Short circuits can occur when the negative and positive terminals come into contact with the battery simultaneously, or due to careless storage habits. For example, batteries can experience a host of problems when they are stored with objects made of metal. As a rule, never store them in a junk drawer or tool chest. If your battery or mod heats up inexplicably, you may have a short circuit on your hands. • Use caution when disposing of your old batteries. Batteries are filled with dangerous chemicals that can produce toxic fumes or cause an explosion, so avoid throwing them in fire or other careless disposal options. Instead, locate a recycling center and take them there. 1 - 2531mAh Hohm Work 18650 Battery.